If you follow my sister's blog Once Upon a Cutting Board, you would have learned yesterday that Canadian Lentils is holding a recipe contest for Canadian food bloggers. When my sister first told me about the contest, I didn't think too much about it...I figured that every idea for lentil recipes has already been created, and that I wouldn't be able to come up with anything new or creative for the contest. 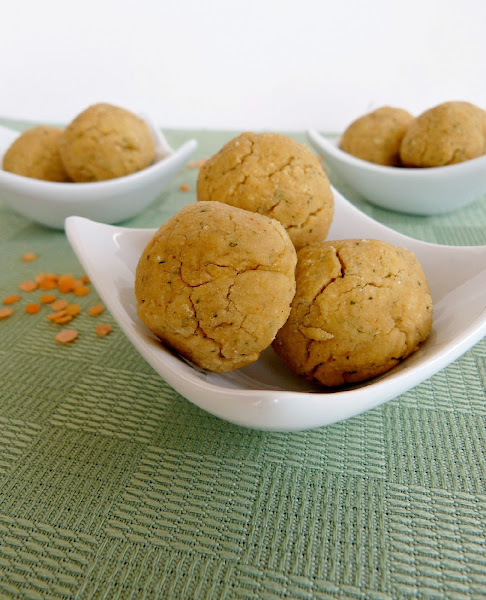 But the more I thought about it, the more determined I became to develop a recipe, and now I'm excited to share what I came up with: these red lentil bites with dried mango and Indian spices. I decided to go with red lentils because I knew they would pair well with some of the flavours and ingredients that I like to cook with. Instead of making a soup or stew, which I would normally do with red lentils, I decided to use them in an appetizer. 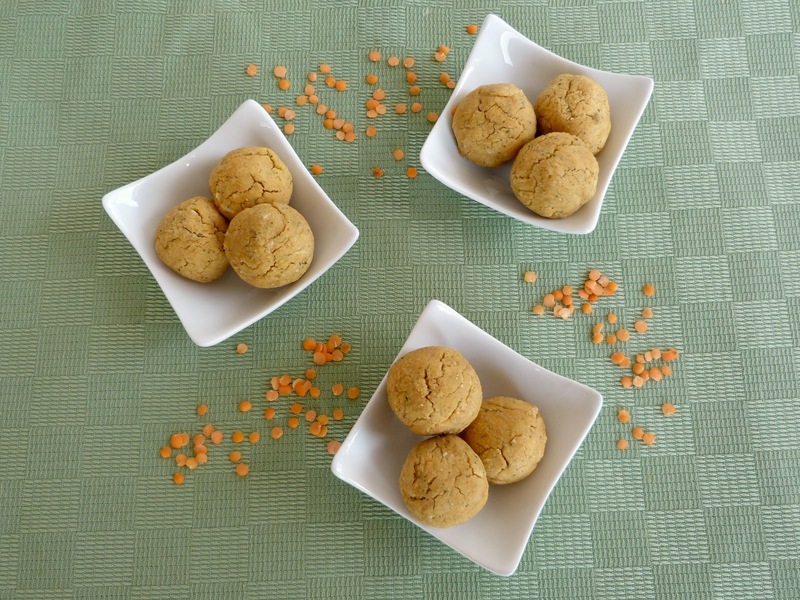 I also knew that you could make tasty and healthy little oven-baked balls using chickpeas, fava beans, or sweet potatoes, so I figured why not use pureed red lentils instead? I started by cooking the red lentils on the stove until they had softened and dried up. Then they went into the food processor along with cilantro, lemon juice, spices, coconut and chopped dried mango. All the ingredients were pureed into a creamy mixture like a hummus, then rolled into balls and baked in the oven. It took a few tries to get the recipe just right, but after some tweaking, they turned out just how I had envisioned - soft on the inside and slightly crispy on the outside, with a nice balance of spices and sweetness from the mango. These are the perfect little snack to pop in your mouth on their own, or you could pair them with a dipping sauce - I think they would taste great with mango chutney! And if you like the sounds of this recipe, I would really appreciate your support in the contest! Besides taste, appeal, use of lentils, and simplicity, one of the judging criteria is social media popularity. So if you have a minute, I would love to receive any comments from you on this post, or you can head over to the Canadian Lentils Facebook page and click "like" on my entry that is posted on their wall. You might find some other entries in the contest that you like there too - like these lentil peanut butter granola bars! Place the lentils and water in a medium-sized saucepan. Bring to a boil over high heat, then reduce heat to medium-low. Simmer for about 20 minutes, until liquid has dried up, stirring occasionally to prevent lentils from sticking to the bottom of the pan. Remove lentils from heat and transfer to a food processor. Preheat the oven to 350°F and spray a glass baking pan (or baking sheet) with cooking spray. Add the remaining ingredients except for coconut and dried mango to the food processor with the lentils and process until everything is fully mixed together. Add the coconut and mango and process again until the mixture has started to form a thick dough (Note: unless you have a really strong food processor, the mango probably won’t fully break down). Scoop out the mixture using a tablespoon measure and form into small balls using your hands. Place balls in the prepared baking pan. Bake for about 20-25 minutes, until the balls are slightly firm to the touch and the bottoms are lightly browned (don't worry if they still feel a bit soft, they will firm up more after cooling). Remove from oven and let cool completely before eating. Store in the refrigerator. Makes 12 balls (recipe can easily be doubled for a larger batch). This is definitely a creative recipe and I love that you tested it so many times to make sure it was right. Your pictures turned out really well too! Thanks! I'm happy with the final version, although I could still envision different variations I'd like to try...maybe with green lentils next! These are so awesome Genevieve.. totally brilliant. its like a spicy and sour soup in a bite! Amazinggg! The link is not working.. i will definitely hit a like on this one! Thank you so much Richa! And thanks for letting me know about the link - I fixed it so it should be working now (you have to look for the "Recent posts by others" on their wall). great, found the page and liked it! Very neat & creative recipe. Love the addition of mango. Lentils are so versatile and so super delicious! Lovely photos! Thanks Courtney! This was the first time I've tried dried mango (bought it at Trader Joes!) and I love it! Very creative!!! I was thinking of entering the contest too! Your entry is fabulous! Thank you! I'd love to see what you come up with too! what delicious looking bites! they remind me just of falafel and i want to eat these now! They are very similar to falafel - they would probably taste good in a pita or naan wrap! Can you get any more creative - I love how so amny of your dishes are indian inspired- the flavors look amazing!! Aw, you're too kind :) I know these aren't authentic Indian, but I like to incorporate some of those flavors...and thanks for liking my entry! Oh my gosh, that's your sister's blog! I made a recipe from it today that I found on Photograzing! So funny. :D I noticed that your bios were very similar! I'm so glad you decided to enter the contest because your entry is making my mouth water! I love the combination of spices and the sweetness from the mango and coconut. It's like Indian falafel, but not fried! That's too funny that you found her blog without realizing the connection! I'm glad you like the recipe - Indian falafel is a good description, I like that! What great flavors rolled up into cute little balls. They would be perfect for an appetizer! Thanks! They are a pretty cute little appetizer, or I just ate a bunch of them to make up a lunch!